A little tree sat at the top of a big hill. From this place he witnesses history's most wondrous events. During his many years of growth he develops a deep relationship with the kindest man who ever lived. But Little Tree has no way of knowing that his friend will one day die a tragic death. Nor does he realize that it is his destiny to be indirectly involved in that death. But tragedy gives birth to triumph. And through Little Tree we, too, can come to know and love the Savior of the world, Jesus. This is a fable for children of all ages. It is a tale of friendship and hope, of adventure and destiny. 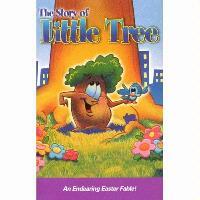 The story of Little Tree will inspire faith and hope in the hearts of all who hear it.